This solar powered wall light with 38 LEDs adopts PIR human motion induction technology and unique light controlling design. 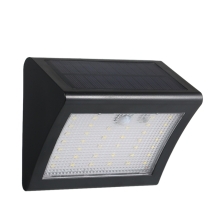 It takes the advantage of high capacity battery, IP65 water resistant, environmental friendly and long duration, which is widely applied to outdoor use such as patio, backyard, garden, balcony, drive way, garage and so on. AUTO WORK: it charges when the solar panel receives light and it discharges when the solar panel is in darkness automatically. ECO-FRIENDLY& ENERGY SAVING: it is powered by sunlight, which not only charges you no money for electricity but also reduce light pollution. PIR MOTION SENSOR & LIGHT SENSOR: at night or dark places, this solar night light will turn on automatically when people come close to the motion sensor range. IP65 WATERESISTANCE: It is IP65 water resistance, be perfect for both indoor and outdoor use. LONG DURATION: it can work 8-10 hours after being fully-charged for 8-10 hours as it adopts a built-in battery with high capacity of 1500mAh. APPLICATION SCENES: it is widely applied to outdoor places such as backyard, garden, driveway, wall, patio, deck, gate, fence and so on. 1. Please charge for several hours the device before first use. 2. The suggested installation height is 3-5meters , the solar panel must not be covered. 3. The protective film should be torn before use. 4. If there is no good sunlight in 3 months, the battery may be out of power, so you have to charge it by bright sunlight, otherwise , it cannot work anymore. 5. If the light blinks, it means the power is low, you should charge it by sunlight soon, otherwise, the device will stop working soon. 6. If there is no good sunlight or in winter sunlight, it may take longer time to fully charge the device and this is very normal for solar products. 7. The induction lighting time extends for 30 seconds after people leave.